In November, Shanghai Shibang Machinery Company (SBM) formed an after-sales service team containing sales elite, R&D Specialist, installation engineers to sample and conduct the return visiting of our numerous domestic clients and their production field. 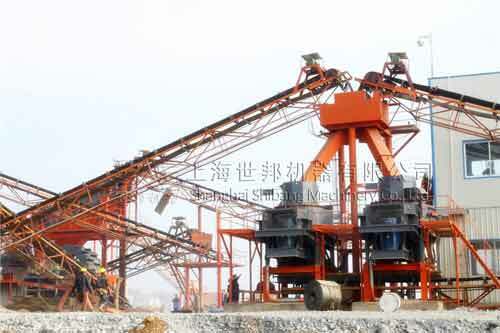 The after-sales service team of engineer Li who is the leader, setting off from Hangzhou, had a complete understanding about service conditions of SBM jaw crusher, CS series cone crusher, VSI series vertical shaft impact crusher, sand washing machine etc, and explained some common problems through training courses. When they discovered at one customer site that the high mud content affected the machine's working efficiency, Mr. Li and his team related immediately the problem by analyzing, and working out a series of solutions for customers, wining their high reorganization. The sampling and returning review in November shows that SBM’s high reliability and service spirit has got the customer’s consistent approval. “The technical personnel of SBM provide us with a lot of help, what is important is that your company thinks for customer’s benefits, which not all enterprises can achieve. That is one of the best comforts for clients. It helps a lame dog over a stile. For SBM, customers are not god, but relatives. Your diligent service makes us feel very warm." The clients they reviewed are mostly engaged in mining industry, having rich technology and experience. The after-service visit team holding a learning attitude got the product change direction through technical communication with customers, which provides the basis for improving product quality and technical innovation.